One of the earliest American maps to identify both Mt. Kenya and Mt. Kilimanjaro. 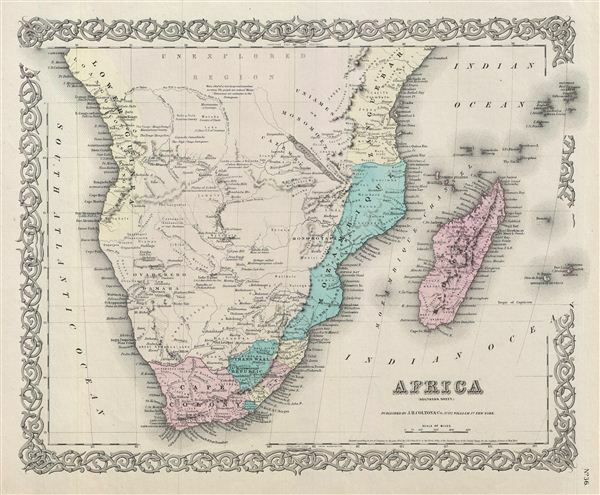 A beautiful 1855 first edition example of Colton's map of southern Africa. Like most of Colton's Africa maps, this map is derived from an earlier wall map of the world produced by Colton and D. Griffing Johnson. The map depicts southern Africa from Mt. Kenya and Cape Lopez in the north to Cape Colony in the South, including Madagascar. This is one of the first American maps of Africa to depict both Mt. Kenya and Mt. Kilimanjaro. Though the interior is labeled 'Unexplored Region,' it does offer a surprising wealth of detail regarding tribal lands and the names of important chiefs. Colton moreover includes speculative mappings of the Congo and a number of other African river systems. Lake Malawi is partially depicted with its northern portions ghosted in as 'Lake Nyassi of the Sea.' The ghosted sections seem to suggest that Colton believed Lake Malawi to be united with Lake Tanganyika (reported but not officially discovered) just to the north. Generally speaking, the coastline is well documented throughout with the Cape Colony, the Transvaal, and British Kafraria receiving special attention. This map also identifies various cities, towns, rivers, volcanoes, mountains, and an assortment of additional topographical details. Surrounded by Colton's typical spiral motif border. Dated and copyrighted to J. H. Colton, 1855. Published from Colton's 172 William Street Office in New York City. Issued as page no. 36 in volume 2 of Colton's 1856 Atlas of the World. Rumsey 0149.103 (1856 edition). Phillips (Atlases) 816.